When I first met Melody Keymer Harper, I knew she was a force for good change in my life. Her positive energy and words of encouragement were what I needed as I demonstrated my brand new technology to her at a marketing event. She knew that I needed to get on stage and share this amazing tech tool with people to help them generate more business. I had never really done any public speaking in the business sector, so she instantly began giving me some pointers. It became quite apparent that I needed a speaking coach, and she seemed like the perfect fit. Melody has over 40 years experience teaching speaking and communication skills to students, educators, business professionals, speakers and authors. She has worked alongside celebrities such as Elvis Presley, Johnny Carson, Betty White, Tori Spelling and more. Melody has given me a new-found confidence to boldly step on stage and share my message in a way that is memorable, influential, and makes me money. Would you like to have the power to stop people in their tracks, get noticed, and have them hang on your every word? How about being able to take a person through the entire buyer's journey in less than 60 seconds? Are you ready to have people lining up to work with you? If you said "yes" to any of these questions you should learn about the disruptive power of the new augmented reality video marketing tool called, REVEALiO. This new tool bridges the realms of reality with virtual reality in a way that allows you to instantly demonstrate who you are and what you do, when you're at a networking event or trade show. Take a look at this video. 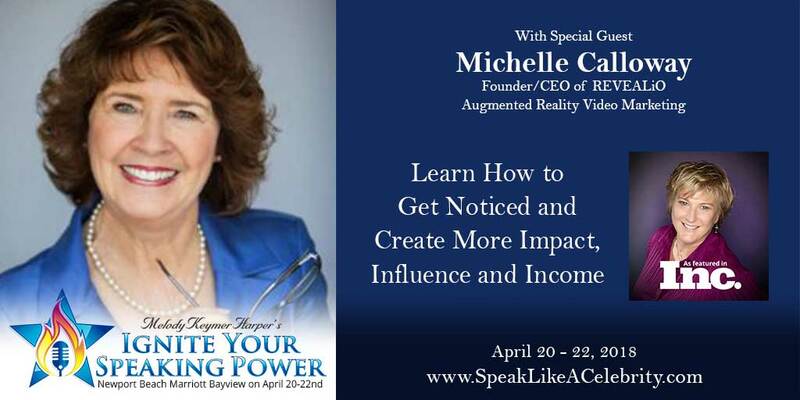 Michelle Calloway, Founder and CEO of REVEALiO will be speaking on stage at the Speak Like a Celebrity Event in Newport Beach, CA on April 20 - 22, 2018. She will be sharing the power of this new disruptive technology, and how it will quickly elevate your level of impact, influence, and income. Please join us. If you're interested in learning more about REVEALiO - Augmented Reality Video Marketing Tool, click here to schedule a free 30 minute consultation.